I knocked my head against a hanging braid of garlic the other day, and instead of the predictable response, I had to smile. That ceiling rack in the garage holds the spice of many meals. And the harvest is the result of nearly effortless planting. Garlic is harvested in late June to early July, when about a third of the leaves have turned brown. Please grow garlic. It’s so easy, and it’s so good. In an earlier post, I went through the steps of planting it, which is done at the end of fall, when there’s plenty of open bed space and not much else happening, besides watching the winter vegetables grow. My garlic hangs in a corner of the garage to cure, from twine attached to a welded-wire grid on the ceiling. Softneck varieties, in the foreground, are braided. Hardnecks are hung upside down. Inchelium Red — This is a softneck garlic with fairly large heads of 12-15 cloves each. I got 10 heads, but 6 are somewhat small and immature. Spanish Roja — My favorite garlic, this Northwest heirloom (sometimes called Greek Blue) is a hardneck that provided us with a nice meal of “scapes” this spring, the flower heads that you cut when they curl up out of the center of the plant. The yield was 13 heads, with about a third of them smaller than expected. 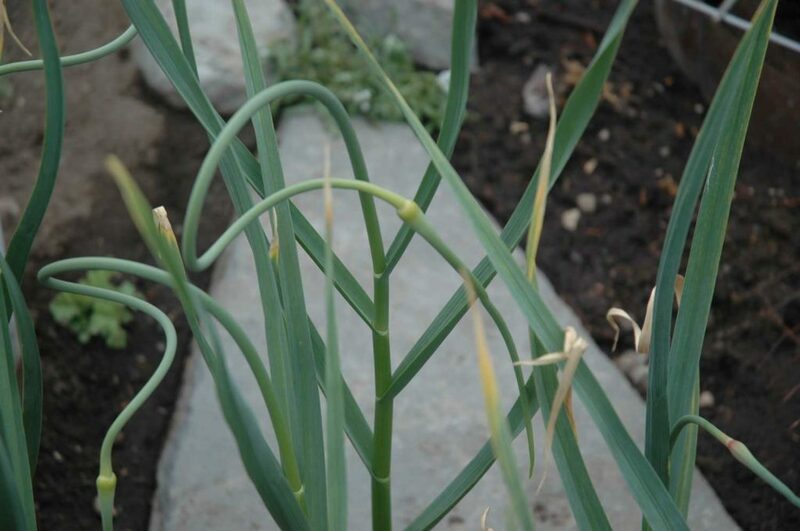 Garlic scapes are the curly seed-heads that emerge from hardneck garlics in mid-spring. Cut them to send more energy to the bulb, then steam or stir-fry them for a fresh spring garlic dish. Killarney Red — A new variety for me, this hardneck garlic shows a soft apricot color beneath its papery skin, belying its name. I haven’t peeled any yet, so a brighter red might be under there. It yielded 8 heads, uniformly on the small side of medium. Lorz Italian — This reliable softneck garlic braided beautifully. It also produced 10 wonderful heads of a generous size, two of which had irregular bulbils growing along the stem. Those irregular growths on the Lorz, as well as two or three heads that came out of the ground soft or damaged, went straight to the kitchen to be used immediately. The rest are pretty much dry now, and soon I’ll cut them down and store them in mesh onion bags, hanging in a dry, cool spot in my basement. As I go to grab a new one for cooking, I’ll run my hands through each bag to make sure none have gotten soft in storage. There are few edibles easier to grow than garlic. Plan now to devote a space in your winter garden to this spicy allium. Next year, the chef in you will thank me.